Die casting is a metal casting process that is characterized by forcing molten metal under high pressure into a mold cavity. The mold cavity is created using two hardened tool steel dies which have been machined into shape and work similarly to an injection mold during the process. Most die castings are made from non-ferrous metals, specifically zinc, copper, aluminium, magnesium, lead, pewter, and tin-based alloys. Depending on the type of metal being cast, a hot- or cold-chamber machine is used. Die casting equipment was invented in 1838 for the purpose of producing movable type for the printing industry. The first die casting-related patent was granted in 1849 for a small hand-operated machine for the purpose of mechanized printing type production. In 1885 Otto Mergenthaler invented the Linotype machine, an automated type-casting device which became the prominent type of equipment in the publishing industry. The Soss die-casting machine, manufactured in Brooklyn, NY, was the first machine to be sold in the open market in North America. Other applications grew rapidly, with die casting facilitating the growth of consumer goods and appliances by making affordable the production of intricate parts in high volumes. In 1966, General Motors released the Acurad process. Silicon tombac: high-strength alloy made of copper, zinc and silicon. Often used as an alternative for investment cast steel parts. Lead and tin: high density; extremely close dimensional accuracy; used for special forms of corrosion resistance. Such alloys are not used in foodservice applications for public health reasons. Type metal, an alloy of lead, tin and antimony (with sometimes traces of copper) is used for casting hand-set type in letterpress printing and hot foil blocking. Traditionally cast in hand jerk molds now predominantly die cast after the industrialisation of the type foundries. Around 1900 the slug casting machines came onto the market and added further automation, with sometimes dozens of casting machines at one newspaper office. 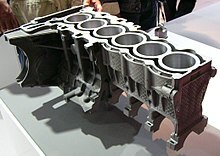 Maximum weight limits for aluminium, brass, magnesium, and zinc castings are approximately 70 pounds (32 kg), 10 lb (4.5 kg), 44 lb (20 kg), and 75 lb (34 kg), respectively. The material used defines the minimum section thickness and minimum draft required for a casting as outlined in the table below. The thickest section should be less than 13 mm (0.5 in), but can be greater. Draft is the amount of slope or taper given to cores or other parts of the die cavity to allow for easy ejection of the casting from the die. All die cast surfaces that are parallel to the opening direction of the die require draft for the proper ejection of the casting from the die. Die castings that feature proper draft are easier to remove from the die and result in high-quality surfaces and more precise finished product. Fillet is the curved juncture of two surfaces that would have otherwise met at a sharp corner or edge. Simply, fillets can be added to a die casting to remove undesirable edges and corners. Parting line represents the point at which two different sides of a mold come together. The location of the parting line defines which side of the die is the cover and which is the ejector. Bosses are added to die castings to serve as stand-offs and mounting points for parts that will need to be mounted. For maximum integrity and strength of the die casting, bosses must have universal wall thickness. Ribs are added to a die casting to provide added support for designs that require maximum strength without increased wall thickness. Holes and windows require special consideration when die casting because the perimeters of these features will grip to the die steel during solidification. To counteract this effect, generous draft should be added to hole and window features. There are two basic types of die casting machines: hot-chamber machines and cold-chamber machines. These are rated by how much clamping force they can apply. Typical ratings are between 400 and 4,000 st (2,500 and 25,400 kg). Hot-chamber die casting, also known gooseneck machines, rely upon a pool of molten metal to feed the die. At the beginning of the cycle the piston of the machine is retracted, which allows the molten metal to fill the "gooseneck". The pneumatic- or hydraulic-powered piston then forces this metal out of the gooseneck into the die. The advantages of this system include fast cycle times (approximately 15 cycles a minute) and the convenience of melting the metal in the casting machine. The disadvantages of this system are that it is limited to use with low-melting point metals and that aluminium cannot be used because it picks up some of the iron while in the molten pool. Therefore, hot-chamber machines are primarily used with zinc-, tin-, and lead-based alloys. A schematic of a cold-chamber die casting machine. These are used when the casting alloy cannot be used in hot-chamber machines; these include aluminium, zinc alloys with a large composition of aluminium, magnesium and copper. The process for these machines start with melting the metal in a separate furnace. Then a precise amount of molten metal is transported to the cold-chamber machine where it is fed into an unheated shot chamber (or injection cylinder). This shot is then driven into the die by a hydraulic or mechanical piston. The biggest disadvantage of this system is the slower cycle time due to the need to transfer the molten metal from the furnace to the cold-chamber machine. Other die components include cores and slides. Cores are components that usually produce holes or opening, but they can be used to create other details as well. There are three types of cores: fixed, movable, and loose. Fixed cores are ones that are oriented parallel to the pull direction of the dies (i.e. the direction the dies open), therefore they are fixed, or permanently attached to the die. Movable cores are ones that are oriented in any other way than parallel to the pull direction. These cores must be removed from the die cavity after the shot solidifies, but before the dies open, using a separate mechanism. Slides are similar to movable cores, except they are used to form undercut surfaces. The use of movable cores and slides greatly increases the cost of the dies. Loose cores, also called pick-outs, are used to cast intricate features, such as threaded holes. These loose cores are inserted into the die by hand before each cycle and then ejected with the part at the end of the cycle. The core then must be removed by hand. Loose cores are the most expensive type of core, because of the extra labor and increased cycle time. Other features in the dies include water-cooling passages and vents along the parting lines. These vents are usually wide and thin (approximately 0.13 mm or 0.005 in) so that when the molten metal starts filling them the metal quickly solidifies and minimizes scrap. No risers are used because the high pressure ensures a continuous feed of metal from the gate. The most important material properties for the dies are thermal shock resistance and softening at elevated temperature; other important properties include hardenability, machinability, heat checking resistance, weldability, availability (especially for larger dies), and cost. The longevity of a die is directly dependent on the temperature of the molten metal and the cycle time. The dies used in die casting are usually made out of hardened tool steels, because cast iron cannot withstand the high pressures involved, therefore the dies are very expensive, resulting in high start-up costs. Metals that are cast at higher temperatures require dies made from higher alloy steels. The main failure mode for die casting dies is wear or erosion. Other failure modes are heat checking and thermal fatigue. Heat checking is when surface cracks occur on the die due to a large temperature change on every cycle. Thermal fatigue is when surface cracks occur on the die due to a large number of cycles. The following are the four steps in traditional die casting, also known as high-pressure die casting, these are also the basis for any of the die casting variations: die preparation, filling, ejection, and shakeout. The dies are prepared by spraying the mold cavity with lubricant. The lubricant both helps control the temperature of the die and it also assists in the removal of the casting. The dies are then closed and molten metal is injected into the dies under high pressure; between 10 and 175 megapascals (1,500 and 25,400 psi). Once the mold cavity is filled, the pressure is maintained until the casting solidifies. The dies are then opened and the shot (shots are different from castings because there can be multiple cavities in a die, yielding multiple castings per shot) is ejected by the ejector pins. Finally, the shakeout involves separating the scrap, which includes the gate, runners, sprues and flash, from the shot. This is often done using a special trim die in a power press or hydraulic press. Other methods of shaking out include sawing and grinding. A less labor-intensive method is to tumble shots if gates are thin and easily broken; separation of gates from finished parts must follow. This scrap is recycled by remelting it. The yield is approximately 67%. The high-pressure injection leads to a quick fill of the die, which is required so the entire cavity fills before any part of the casting solidifies. In this way, discontinuities are avoided, even if the shape requires difficult-to-fill thin sections. This creates the problem of air entrapment, because when the mold is filled quickly there is little time for the air to escape. This problem is minimized by including vents along the parting lines, however, even in a highly refined process there will still be some porosity in the center of the casting. Most die casters perform other secondary operations to produce features not readily castable, such as tapping a hole, polishing, plating, buffing, or painting. After the shakeout of the casting it is inspected for defects. The most common defects are misruns and cold shuts. These defects can be caused by cold dies, low metal temperature, dirty metal, lack of venting, or too much lubricant. Other possible defects are gas porosity, shrinkage porosity, hot tears, and flow marks. Flow marks are marks left on the surface of the casting due to poor gating, sharp corners, or excessive lubricant. Water-based lubricants, called emulsions, are the most used type of lubricant, because of health, environmental, and safety reasons. Unlike solvent-based lubricants, if water is properly treated to remove all minerals from it, it will not leave any by-product in the dies. If the water is not properly treated, then the minerals can cause surface defects and discontinuities. There are four types of water-based lubricants: oil in water, water in oil, semi-synthetic, and synthetic. Oil in water is the best, because when the lubricant is applied, the water cools the die surface by evaporating while depositing the oil, which helps release the shot. A common mixture for this type of lubricants is thirty parts water to one part oil, however in extreme cases a ratio of 100:1 is used. Oils that are used include heavy residual oil (HRO), animal fats, vegetable fats, and synthetic fats. HROs are gelatinous at room temperature, but at the high temperatures found in die casting, they form a thin film. Other substances are added to control the emulsions viscosity and thermal properties; these include graphite, aluminium, and mica. Other chemical additives are used to inhibit rusting and oxidation. Emulsifiers are added to water-based lubricants, so that oil based additives can be mixed into the water; these include soap, alcohol esters, and ethylene oxides. Historically, solvent-based lubricants, such as diesel fuel and kerosene, were commonly used. These were good at releasing the part from the dies, but a small explosion occurred during each shot, which led to a build-up of carbon on the mold cavity walls. However, they were easier to apply evenly than water-based lubricants. Excellent dimensional accuracy (dependent on casting material, but typically 0.1 mm for the first 2.5 cm (0.004 inch for the first inch) and 0.02 mm for each additional centimeter (0.002 inch for each additional inch). The main disadvantage to die casting is the very high capital cost. Both the casting equipment required and the dies and related components are very costly, as compared to most other casting processes. Therefore, to make die casting an economic process, a large production volume is needed. Other disadvantages are that the process is limited to high-fluidity metals, and casting weights must be between 30 grams (1 oz) and 10 kg (20 lb). [note 3] In the standard die casting process the final casting will have a small amount of porosity. This prevents any heat treating or welding, because the heat causes the gas in the pores to expand, which causes micro-cracks inside the part and exfoliation of the surface. Thus a related disadvantage of die casting is that it is only for parts in which softness is acceptable. Parts needing hardening (through hardening or case hardening) and tempering are not cast in dies. ^ For short-run zinc castings only. ^ a b c d e f g h Nitrided. ^ Die casting is an economical alternative for as few as 2,000 parts if it eliminates extensive secondary machining and surface finishing. ^ "Die Casting vs Other Processes". Retrieved 2016-09-16. ^ Machinery's reference series, The Industrial Press, retrieved 2013-11-18. ^ About die casting, The North American Die Casting Association, archived from the original on 15 October 2010, retrieved 15 October 2010. ^ a b Liu, Wen-Hai (2009-10-08), The Progress and Trends of Die Casting Process and Application, archived from the original on 2010-10-20, retrieved 2010-10-19. ^ a b c d e f g John L., Jorstad (September 2006), "Aluminum Future Technology in Die Casting" (PDF), Die Casting Engineering: 18–25, archived from the original (PDF) on 2010-11-12. ^ Die Casting, efunda Inc, retrieved 2008-04-12 . ^ a b FAQ About Die Casting, archived from the original on 15 October 2010, retrieved 12 April 2008 . ^ Alloy Properties, The North American Die Casting Association, archived from the original on 2013-06-06, retrieved 2008-04-12 . ^ a b c d Degarmo, p. 331. ^ "Parting Line". Retrieved 2016-09-16. ^ a b c Degarmo, pp. 329-330. ^ a b c Degarmo, p. 330. ^ a b c d Davis, p. 251. ^ a b Degarmo, p. 329-331. ^ Schrader, George F.; Elshennawy, Ahmad K.; Doyle, Lawrence E. (2000), Manufacturing processes and materials (4th ed. ), SME, p. 186, ISBN 978-0-87263-517-3. ^ Brevick, Jerald; Mount-Campbell, Clark; Mobley, Carroll (2004-03-15), Energy Consumption of Die Casting Operations (PDF), Ohio State University, (US Department of Energy Grant/Contract No. DE-FC07-00ID13843, OSURF Project No. 739022), retrieved 2010-10-15. ^ Andresen (2005), pp. 356–358. ^ Andresen (2005), p. 355. ^ Andresen (2005), p. 356. Davis, J. (1995), Tool Materials, Materials Park: ASM International, ISBN 978-0-87170-545-7. Andresen, Bill (2005), Die Casting Engineering, New York: Marcel Dekker, ISBN 978-0-8247-5935-3.